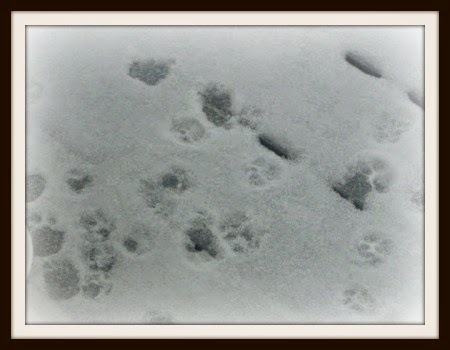 The snowy weather didn't stop Orange Kitten from dropping by for a wee visit and a kitty snack. 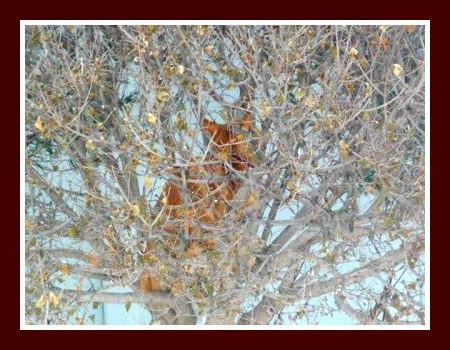 I took the picture below a few weeks ago, when she was after the birds in the tree. Naughty, naughty. Today, she was not interested in the birds or tree-climbing -- she was only interested in treats. Hope you have a purr-fectly fine day, no matter what the weather is in your part of the world. The last gasps of winter... the little orange cat must be pretty hardy to go out in it. Good of you to give it a treat.